We’re all about providing the little things at Mountain Mavericks. From being woken up at your desired time with a cup of tea (…or stronger), to being provided with quality toiletries that you won’t find in any other chalet or hotel in the alps on your arrival. We honestly believe that these things make your holiday memorable and that it truly is the little things that count. Did our guests like it? The response from our guests this season about our new partnership with Neal’s Yard Remedies has been great. From the lavish body wash giving you the energy to get up on the mountain in the morning, to the subtle hand wash in each bathroom – a popular addition across all of our chalets in Morzine! 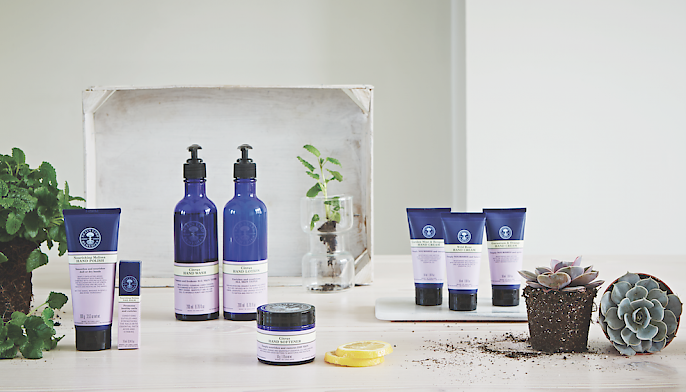 If you haven’t tried or heard about Neal’s Yard Remedies – then visit their website and scroll through their amazing products. The company has a ‘look after the planet while providing a quality product’ ethos. Something that mirrors Mountains Mavericks, making it a natural fit working together. We have a range of NYR products throughout the chalet, including a different Essential Oils Diffuser, which makes each chalet smell particularly nice when you arrive back from the slopes. We change this throughout the year to match seasons and keep the chalets feel as homely as possible. We can’t wait to keep providing you with the best quality products on the market in our chalets. We will be increasing our Neal’s Yard Remedies Shampoo, Body Wash & Hand Lotion range next season. What scent or flavour would you like to try on your ski holiday in Morzine? Send us a Facebook message with your thoughts! To celebrate our partnership – Neal’s Yard Remedies have a great discount code for you loyal Mountain Mavericks! So if you haven’t stayed with us this season (all guests received a discount code voucher for our various partners at the start of their stay) and would like to try Neal’s Yard Remedies products, or get a great gift for a loved one (P.S it’s Fathers Day on June 19th). Where can you find Neal’s Yard Remedies outside of our chalet? For convenience, if you fly into Gatwick Airport and are heading to London – simply visit the Neal’s Yard Remedies Store in London Victoria Station (near to the Gatwick Express Port) and speak to experts about their products. Our voucher is only applicable online. Alternatively, visit their website or Facebook channel for more store locations! Previous: Mountain Mavericks Summer Pop-Up Chalet At Castleford Snowdome! Next: Mummy Snowboarder – Pushing the Limits!